This topic describes minimum hardware requirements for Storage Spaces Direct. For production, Microsoft recommends these Windows Server Software-Defined hardware/software offers from our partners, which include deployment tools and procedures. They are designed, assembled, and validated against our reference architecture to ensure compatibility and reliability, so you get up and running quickly. Learn more at https://microsoft.com/wssd. Want to evaluate Storage Spaces Direct but don't have hardware? 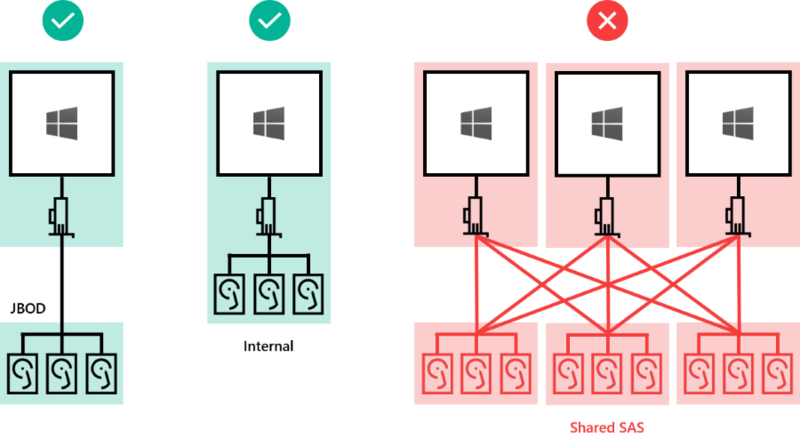 Use Hyper-V or Azure virtual machines as described in Using Storage Spaces Direct in guest virtual machine clusters. Systems, components, devices, and drivers must be Windows Server 2016 Certified per the Windows Server Catalog. In addition, we recommend that servers, drives, host bus adapters, and network adapters have the Software-Defined Data Center (SDDC) Standard and/or Software-Defined Data Center (SDDC) Premium additional qualifications (AQs), as pictured below. There are over 1,000 components with the SDDC AQs. The fully configured cluster (servers, networking, and storage) must pass all cluster validation tests per the wizard in Failover Cluster Manager or with the Test-Cluster cmdlet in PowerShell. Storage Spaces Direct works with direct-attached SATA, SAS, or NVMe drives that are physically attached to just one server each. For more help choosing drives, see the Choosing drives topic. NVMe driver is Microsoft's in-box or updated NVMe driver. NOT SUPPORTED: RAID controller cards or SAN (Fibre Channel, iSCSI, FCoE) storage. Host-bus adapter (HBA) cards must implement simple pass-through mode. Drives can be internal to the server, or in an external enclosure that is connected to just one server. SCSI Enclosure Services (SES) is required for slot mapping and identification. Each external enclosure must present a unique identifier (Unique ID). 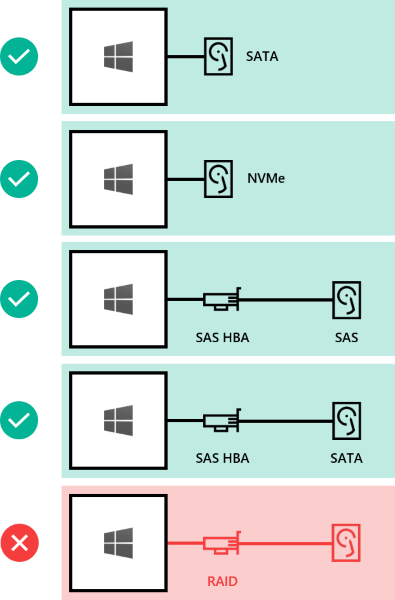 NOT SUPPORTED: Shared SAS enclosures connected to multiple servers or any form of multi-path IO (MPIO) where drives are accessible by multiple paths. This table provides the minimum for hardware deployments. If you're deploying with virtual machines and virtualized storage, such as in Microsoft Azure, see Using Storage Spaces Direct in guest virtual machine clusters.